Now in Freya’s bedroom we have white carpet… I know, not the best choice of colour for a baby/toddlers bedroom. But when we planned and decorated the nursery, we didn’t know whether we were having a boy or a girl. So we decided to keep it neutral and then had the option to add any colour afterwards. We love the contrast between the grey walls and the white carpet, then we painted the wardrobes and chest of drawers white to match. Well I say we… I did on maternity leave… waddling around at 37 weeks pregnant, all with butterflies in my stomach thinking about the little baby that would soon be here, with clothes to fill these wardrobes and drawers. Oh it was such an exciting and wonderful time. 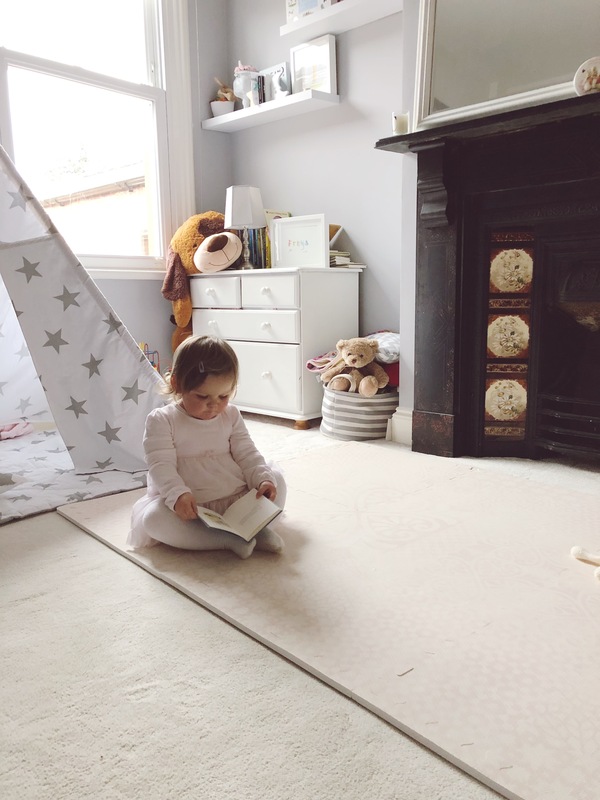 Once Freya was born we soon realised we needed a rug in her room, not just to protect the carpet, but as an area for play. We would sit down and play with toys and now we sit and read books also; it is nice to be on the floor and playing. 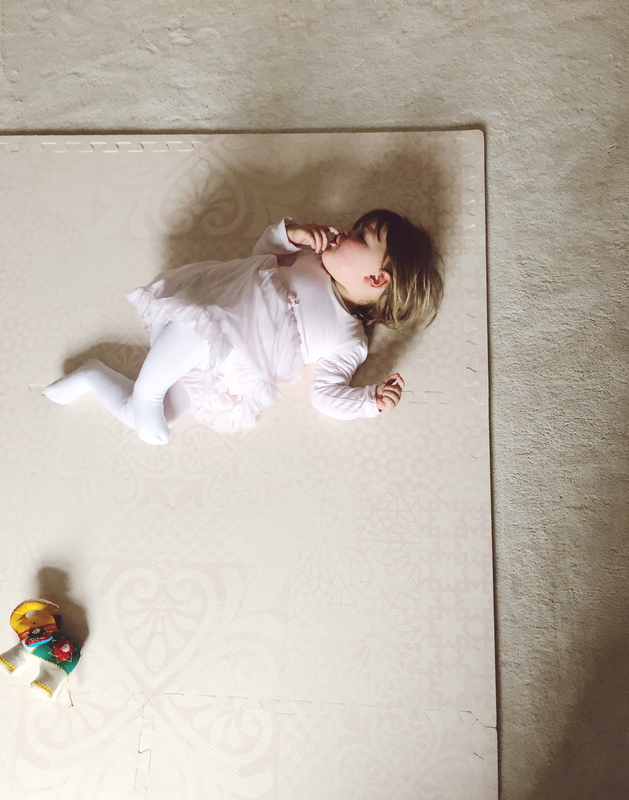 So when Toddlekind got in contact and very kindly gifted me their Blossom Playmat, it was the perfect addition to Freya’s room. It replaced the rug and is much more practical, whilst still being stylish and interesting; I love that it has brought a hint of pink to the room. 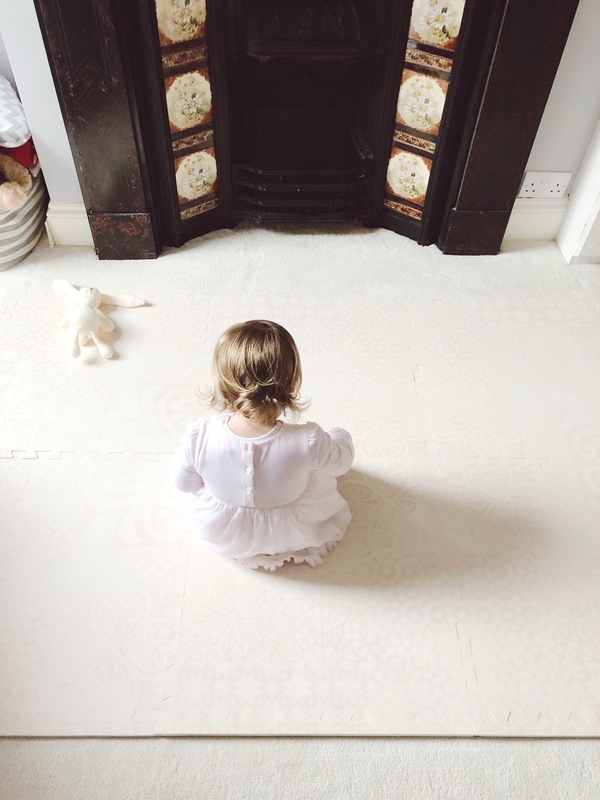 The Blossom Playmat is from the Persian collection, there is also a Nordic collection which I loved also… but felt this style would suit our house more. But head over to their website to take a look for yourselves. The playmat arrived in 6 pieces and was very easy to put together; it even came with an instruction leaflet to explain how to piece the mat together. It is very thick and comfortable to sit and play on, just what we want for our little ones. It is practical whilst still being a stylish addition to Freya’s nursery. So if you’re not already following Toddlekind, then take a look at their playmats for something a little different from the norm. You won’t be disappointed. Mumxiety… yes that is a word. My new role: A working mum. Previous Post Tips on how to get yourself ready with a toddler, without getting stressed!